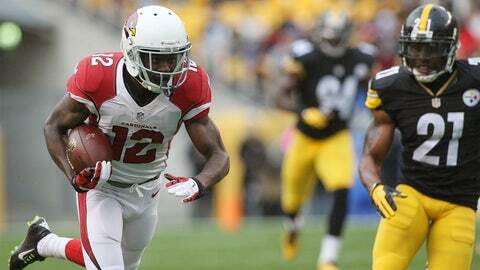 John Brown had 10 catches for 196 yards in Sunday's loss at Pittsburgh. John Brown put up monster numbers Sunday, but the second-year wide receiver for the Arizona Cardinals was fixated more on what he failed to do. Brown’s third-quarter fumble turned the momentum and led to the go-ahead touchdown in the Pittsburgh Steelers’ come-from-behind, 25-13 victory over the Cardinals. It ruined an otherwise magnificent performance by Brown, who established career bests with 10 catches for 196 yards. Oh hey John Brown! 196 rec yds today. T-2nd most by any Cardinals player. Arizona carried a 10-3 lead into the third quarter despite a staggering 279-59 edge in total yards at the half. After allowing a long field goal on the opening drive of the second half, Brown fumbled on the second play of the ensuing drive and Pittsburgh recovered at the Cardinals’ 32-yard line. Third-string quarterback Landry Jones replaced Michael Vick and quickly converted the miscue into a touchdown pass to give the Steelers a 12-10 edge. The Cardinals could manage only a field goal the rest of the way despite a string of big catches by Brown, including receptions of 12 and 19 yards before Carson Palmer threw a killer interception in the end zone.